Star Swings began creating their play and swing sets in 2005. In 2012, Levi took over the business and ensured that it remained, to this day, family-owned and operated. Dedicated to family fun, Levi and his team continued to create beautiful, high-quality swing sets for Lancaster County PA and surrounding areas. By creating safe, durable swing sets, not only have they brought countless hours of enjoyment to children, but they have also secured themselves as true, trusted craftsmen of swing sets – ones that are looking forward to helping you find the perfect swing set for your family today. Handmade wooden lawn games and accessories. Corn hole Jenga Washers Yardzee Kubb Collapsible Wine Caddies. We’re proud to be a leading locksmith company offering a complete range of locksmith services, Car Lockouts, and security systems solutions to commercial and residential clients throughout Alexandria, VA. 24 Hour Emergency Services available including weekends and holidays. When you need us, we’re there! Our main goal is to provide professional, efficient and reliable locksmith services at competitive rates. From commercial to residential locksmith issues, we handle every single project with care and close attention to ensure 100% customer satisfaction and great results. We’re proud to be a leading locksmith company offering a complete range of locksmith services, Car Lockouts, and security systems solutions to commercial and residential clients throughout Vienna, VA. 24 Hour Emergency Services available including weekends and holidays. When you need us, we’re there! Our main goal is to provide professional, efficient and reliable locksmith services at competitive rates. From commercial to residential locksmith issues, we handle every single project with care and close attention to ensure 100% customer satisfaction and great results. We’re proud to be a leading locksmith company offering a complete range of locksmith services, Car Lockouts, and security systems solutions to commercial and residential clients throughout Washington, DC. 24 Hour Emergency Services available including weekends and holidays. When you need us, we’re there! Our main goal is to provide professional, efficient and reliable locksmith services at competitive rates. From commercial to residential locksmith issues, we handle every single project with care and close attention to ensure 100% customer satisfaction and great results. Create a place for your kids’ imaginations to grow and run free with a custom backyard playset from Amish Direct Playsets. Featuring vinyl and wood playsets and accessories built by leading Amish manufacturers in Lancaster County, PA, our collection is known for their quality and durability, providing your children with years of fun, imaginative play. Our catalog of vinyl and wooden playsets includes dozens of styles, layouts, and features. No matter your space requirements or budget, we have a playset that is right for you. All our playsets are customizable, so you can choose the color, accessories, and accents. Fun accessories include slides, ladders, bridges, tunnels, and rock climbing elements, so you can create a unique, one-of-a-kind play set for your backyard. We offer free delivery to homes in southeastern Pennsylvania, northeastern Maryland, and New Castle County in Delaware. Playsets over $1,500 also include free installation; you can request installation for smaller playsets for a fee. We also offer nationwide common carrier shipping; contact us for rates and information. Visit our website to browse our online catalog or design your own backyard playset. To place an order, contact us or find a local Amish Direct Playsets dealer nearest you. King Swings is a family owned and operated play set manufacture based in the beautiful Lancaster County Pennsylvania. 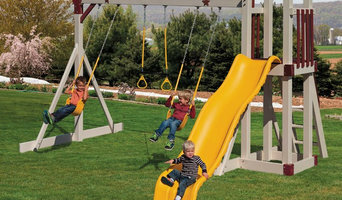 Made by some of the finest Amish craftsman in the nation our swing set accessories are built to accommodate adult weight. Maryland Robotics Summer Camp for Kids Robotics Engineering and Game Play Summer Camp. At this Maryland Robotics camp for kids, campers can choose to build robots using Tetrix Prime, Lego Mindstorms or a combination of both. In addition students may wish to test their programming skills in a virtual environment. Students will build robots and familiarize themselves with a robotic programming language they wish to learn. They will use their own robots, pre-built robots, or virtual robots to complete several different challenges. • Students can continue to work on individual programming challenges or enter competitions that allow robots to compete against one another. The competitions will test the ingenuity of the young engineers as they match their unique robotic designs. • Students build robots from a variety of exciting possibilities. • Students can build their own unique and treasured designs. With little ones in the home, safety is likely foremost in your mind, especially for structures that are designed for them to climb on, swing from and jump over. If you’ve decided to add an outdoor play system to your yard, it’s well worth hiring a Lutherville Timonium, MD professional to craft one that’s solid and secure. Even if you choose to purchase a kit, an installer can ensure that it’s put together correctly and that it will hold up with heavy use. Outdoor play system professionals design and build custom playhouses, playsets and other equipment, and also install prefabricated kits. They can design a playhouse to look like the main home or come up with a completely unique concept that suits the parents’ and kids’ fancies. Because playset kits can be quite tricky and time consuming to assemble, many Maryland homeowners hire professionals to handle the job both for convenience and for peace of mind with regard to safety and structural integrity. Here are some related professionals and vendors to complement the work of outdoor play systems: Backyard Courts, Landscape Contractors, General Contractors, Woodworkers & Carpenters. Find an outdoor play system professional on Houzz. Narrow your search in the Professionals section of the website to Lutherville Timonium, MD outdoor play systems. You can also search farther afield for a pro who fits your project’s needs.